Create A Professional Resume In Minutes! Our top-rated tool is like working with a resume professional every step of the way. Select professional templates and designs with a single click. Here's a little secret: hiring managers often decide whether or not to interview someone based on the first 15 seconds of seeing their resume! When you apply for a job, your resume is your first impression. That's why it's the best opportunity you will have to make a professional statement. A good resume is well-organized, well-written, and effectively highlights your accomplishments. With our tool, professional formatting is a breeze. You can select from your choice of professional resume templates with a single click. No more worrying about formatting issues! "I love the phrase suggestion feature - it helped me build a professional resume quickly and highlight my accomplishments effectively. Thank you so much for a wonderful service!" -Pam S.
"This is an awesome service. I hate writing resumes and this just made it really simple. My end result was great; I've already received a few interviews. Thanks for making my resume stand out!" -Jack K.
A great resume is what will set you apart from the other candidates and ensure you have the best chance at getting offered a position with the company of your dreams. Luckily, creating a resume doesn’t have to be difficult. There are plenty of ways to create a unique and professional resume online so you’ll be prepared for your next employment application and interview. If you don’t have any experience with creating a resume, there are many online resources that can get you started. To start, look for some professional resume examples. A good sample resume should give you an idea of the information you’ll need to include in your own resume. You can also use these samples to see what kinds of fonts and layouts are appropriate for a great resume. 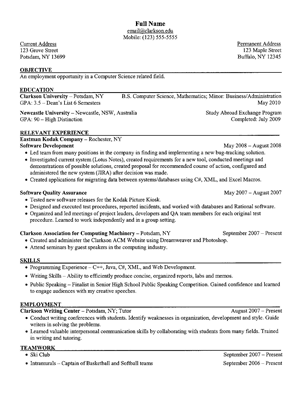 Many websites also have resume templates you can use to create your own personal resume. Templates can often be downloaded and then used in a word processor. You’ll need to fill in each pre-determined section with your own information. Using a resume template is a great way to get an organized look for your resume, even if you aren’t very familiar with using word processor programs and professional documents. If you really need help completing your resume, look for an online resume builder. This is the easiest option, and it will ensure you end up with a professional result. A resume builder will have you simply provide your information into a webpage. It might ask you what type of resume you are looking for, whether it’s professional, academic, or casual. After entering your information and picking the right options, your personalized resume will be ready. You can preview it and make sure it looks correct. Then, you’ll be able to save the resume to your hard drive to print it out. You will need a lot of information for your resume to be complete. Be prepared to list your education, previous work experience, and any honors and awards you’ve received. The information you include on your resume should be related to the job you are applying for. Be sure to include your current personal contact information as well. Give your address, phone number, and email address so the employer will have different ways to contact you. Whether you are creating a resume from scratch, using a template, or plugging your information into a resume builder, you need to double check all the information! A spelling error or typo on your resume could be the difference between landing your dream job or ending up back in the unemployment line. If you can, have someone else look over your resume too. It never hurts to have another set of eyes looking for errors. Your resume is the most important document when it comes to applying for jobs. Making yourself stand out with a professional resume can help you land an excellent position with a prestigious company. Whether you are a resume novice or expect, use the above resources to help you get started in the application process. An outstanding resume is the holy grail of all job seekers – something that we all strive for but rarely attain. Hiring managers love to see them too, since they have to wade through a stack of uninspiring ones on a daily basis (and by "stack" I mean a digital stack, or a cluttered inbox rife with attachments). If you're a job seeker seeking to unlock the mystery of making your resume a standout among the stack, you're not alone. After all, this is the document that can determine whether or not you get to the next phase of the hiring process. So, what will it take to make your resume outstanding? The first key is to understand how resumes are organized. If you're just putting dates, companies, and achievements on a page with no sense of strategic organization, then you're setting yourself up for disappointment. The fact is that hiring managers look for certain patterns, and you'll be better off if you use an organizational pattern that's both logical and easy to read. If you're not sure what format to use, stick with the always popular reverse chronological pattern. In this pattern, you will list your educational achievements in order from most recent to least recent; you'll also list your occupational achievements in this manner. On the other hand, if you have gaps in your occupational or educational history that are difficult to explain, you should use a chronological format, in which dates are omitted or de-emphasized (i.e., just put the years and not any specific dates) and the overall focus is your skills and achievements. Another key to success is crafting a slightly different resume each time you're applying for a job position. It's fine to use a free resume maker that you've found online as long as you change it and make it fit each job vacancy. The idea is to use the words in the job description, the advertisement where you learned about the job (if that's how you found the job opening), the company's website, and popular keywords pertaining to the particular job industry. Many job seekers have succumbed to the temptation to construct a generic resume with a free resume builder and then blast it out to dozens of employers. This shotgun type of approach will only get you nowhere fast, as hiring managers can tell when you're not putting much effort into your job hunt. The next key is to focus on how you can benefit the employer and, more specifically, the hiring manager. He or she wants to know the answer to the question: "What's in it for me and my company?" Take your objective section, for example. Does it only mention your career aspirations? If so, then you've got a self-centered resume and it's time for a makeover. Gear your objective section, along with the rest of the text, toward the needs of the employer. Mention how you would help their clients, their quota, their bottom line, or whatever their target may be. If you've done this correctly, you'll make it extremely tempting for the hiring manager to put you on the short list of preferred job applicants. Now, let's ask ourselves a fundamental question: Do you see numbers interspersed throughout your resume? That's the next key to getting a callback, and hopefully the answer to the question is "Yes!" When looking through a page packed with text, it's human nature to see the numbers popping out and grabbing our attention. You don't need to have a number on every line, but inserting a number every few lines is a smart move. The best numbers are stats that demonstrate results benefiting companies you've worked for previously; these are usually far more significant than grade point averages and other academic stats. Numbers with percent signs are great – and numbers with dollars signs before them are even better! Then there's the key that so many people seem to forget, yet it's absolutely crucial: Check your resume over at least twice for errors. Even a single spelling mistake, grammatical gaffe, or missing punctuation mark will mar a nearly perfect resume and cause it to be discarded without a second thought. Think about it: If you send a document with errors, what does that say about your ability to provide an excellent product or service? Nobody's perfect, but anything you send to a potential employer needs to be absolutely flawless. If your spelling and grammar skills aren't exactly sterling, there's nothing wrong with hiring a professional writer or editor to assist you; it's a relatively small investment that could make the difference between gainful employment and a protracted, frustrating job search. Without a doubt, a sparkling resume is only one piece of a complex puzzle in your job hunt; there's also the cover letter, the interview, the art of networking, and too many other factors to mention. Sometimes the whole process can be baffling and downright stressful. Nonetheless, learning and perfecting the keys to an outstanding resume is a necessary step on the long, tough road to employment. Use these keys to unlock your potential and let your next employer see what you've got to offer.